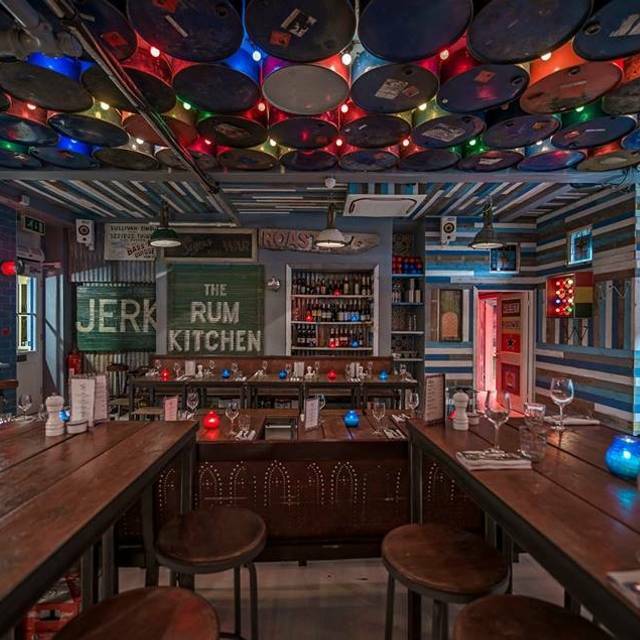 Rum Kitchen is a Caribbean inspired beach shack restaurant and cocktail bar. We currently have two sites, one nestled in the heart of Soho & the other in Notting Hill. Very busy restuarant. Food fairly standard. We enjoyed the cocktails. They did not have our booking, but found us a table. 45 for server to take our order? The fish arrived raw, the replacement never arrived. The food that did arrive was nice. I think they had issues that evening. As always, the food is great at the Rum Kitchen. The service is consistently slow/disorganised but I take that as just being in line with the island vibes. 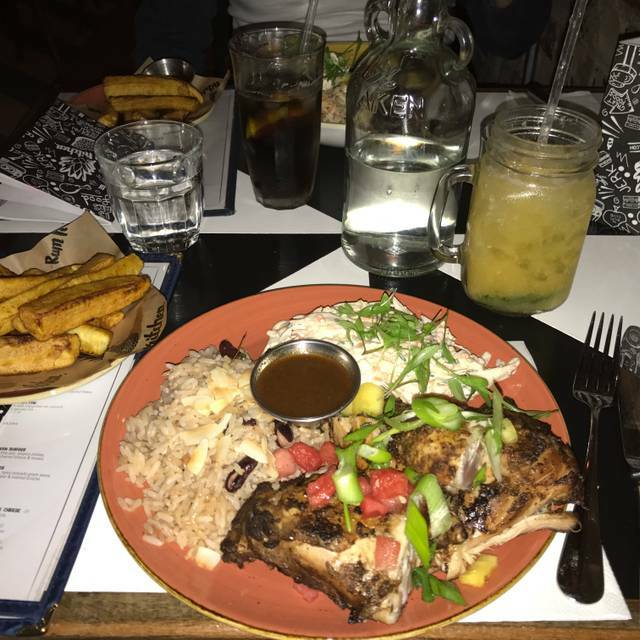 I come back here time and time again, whether you order the jerk chicken, curry mutton or the red snapper it is always great food which leaves you feeling happy. Food was great! Service by Nevda was brilliant! Music was great but too loud for a Monday early evening- as we were shouting to talk over it. Manager turned it down. Brilliant. Great vibe in there, I really enjoyed my food. Good priced cocktails. 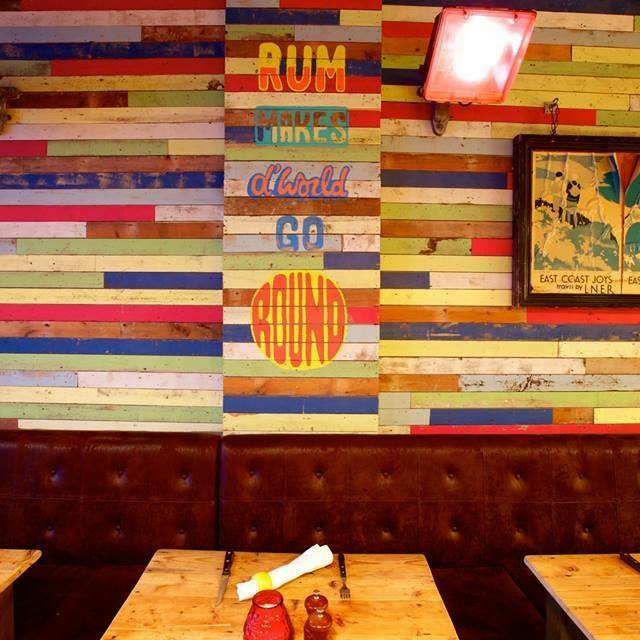 Went to the Rum Kitchen for a date. We were immediately shown to seats (though we wouldn't have minded a wait). A live DJ set was played throughout adding more of a community feel to the restaurant. The cocktails were fab, with a variety of options. Portion sizes were money worth. I would have liked a few more vegetarian options. We've visited here a few times and always had a great experience, however on our most recent visit the service was pretty poor. We had to wait ages for drinks (asking on more than one occassion) and the food was not up to it's normal standard. This place is definitely worth visiting but be prepared for long waits. Went here after looking at the great reviews. The food was tasty but we were served our starters at the same time as our main dishes. We must be getting old as we found the music way to loud to hold a conversation without shouting. Friendly staff although they forgot to bring our bill after asking for the second time, it looked like the manager had to remind the waiter. Overall although the meal was lovely but the service and the loud music wasn't what we were expecting. Would visit again, maybe not on a Saturday night. It is hard to find a decent Caribbean that is not overpriced and actually taste like it's fresh out the Caribbean and not an imitation . Loved it ! Although , some happy hour cocktails were abit shocking , stray away and opt for something more tropical . Enjoy !! Great evening. Food was extremely good, service was amazing and the vibe of the restaurant and bar was cool especially with a live DJ. Second visit here, nice vibe, good food and friendly service again. Fantastic food, the jerk bowl is lovely. Our family thoroughly enjoyed. Would highly recommend. Absolutely amazing restaurant. Would definitely recommend this to a friend. Music was way TOO loud, we had to practically shout to hear each other. Otherwise tasty food. Great place great food subpar service. Waitresses didn't smile, don't attend the table. We asked for the bill, it came late we asked for the card machine, it didn't arrive. So we ended up going to the till ourselves. Next time, we will just walk out thinking you just don't want us to pay for your service. Poor service overall we were waiting for our food for an hour and when it arrived it was underwhelming. The staff were all over the place mixing up customer orders. I was really surprised when I found the restaurant, it was so different, the atmosphere was great. It a really funky, chilled gem. Definitely worth a visit. Superb. Service is slow but food, music and ambience make up for it! Actually a nice place at a central location. However, the food is only snack level our cocktails were tasteless. We enjoyed the cocktails, the food was delicious and portions were too big for either of us to finish! The atmosphere is great, there's a real buzz to the place. 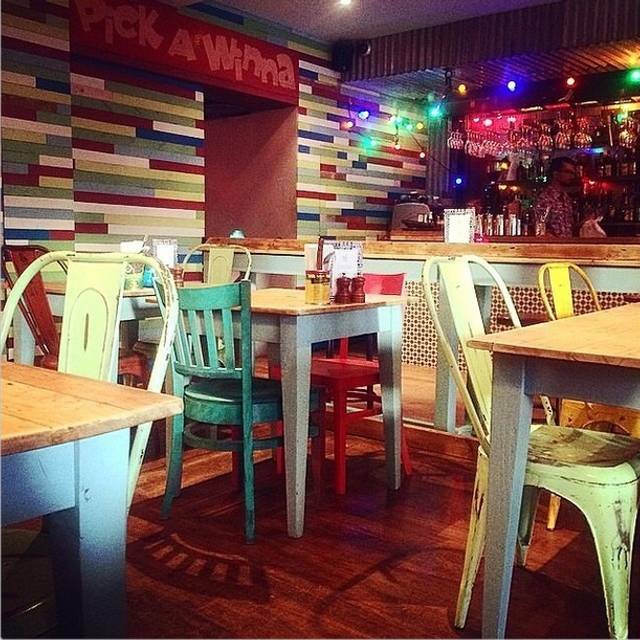 It's not the place for a quiet candle lit date, but for a have a few drinks and a laugh sort of date it's perfect. Booked a meal here Saturday evening not impressed .We ordered a drink whilst waiting for our table, soon got seated but waited ages for a glass for my wifes drink after asking 3 times then ages for our order to be to come,the starters then arrived same time as mains .Some food was not as stated on menu and rice was cold not very good at all and certainly not worth the money. Great place to eat, just a shame the lady who served me had an attitude problem. Made my partner and I feel very unwelcome. Also took 30 minutes before we could order a drink.. that was after I had to go and get someone to make an order. Then that took another 10 minutes to arrive! We drove over an hour to come and eat here, the food was wonderful. Just a great shame about the service we recieved from the grumpy young lady. Second time here. The food is delicious. Authentic curry mutton. Service very prompt initially but unfortunately when we most needed it to be quick, it was very slow. We ordered a last drink with the bill. The bill came immediately but we waited 25 minutes for the drinks which then meant we had to rush them as we were going on somewhere else after. We had to return our food twice as rice was cold. Starters came at the same time as mains. Drinks took ages to arrive. Not impressed with the service . Was told the manager would come speak to us still waiting!!! The food was disappointing, a lot of the meat was tough and grisly. Two of our meals were forgotten meaning two of the diners had to wait while others ate until their food came. The drinks were all lovely, although slightly overpriced in some places. 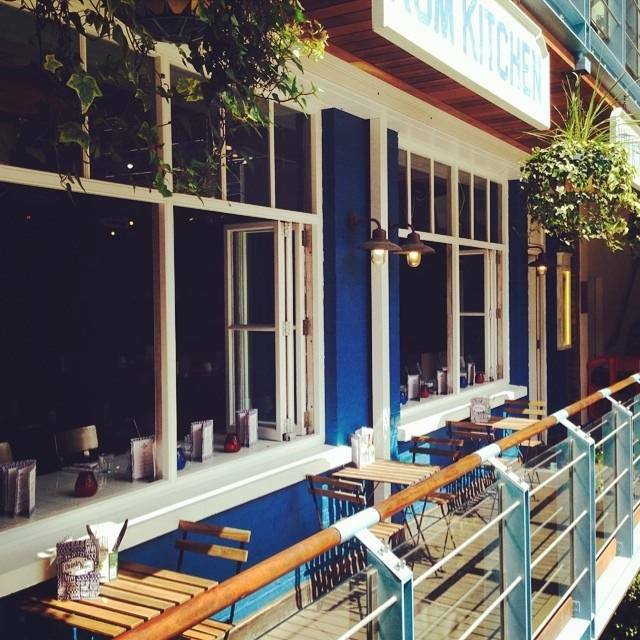 I would recommend Rum Kitchen for a casual lunch and drinks. Drinks: Two drinks were ordered at 7:00pm, and only got served at 8:10pm. During that time, three waiters had said they would check on the order, while the manager said the drink would be on the house because of the long wait. The bill came and we were still charged for the drinks. We informed the staff of error, and he said he would fix that. Bill came back with the drinks still charged. We gave up and simply paid and left. Also, our drinks (not happy hour drinks by the way) were disappointing. Food: Breast cut of the jerk chicken was incredibly dry and tough. The thigh cut was alright, but neither was close in terms of quality to the stuff you find around Brixton or anywhere else with decent jerk. Starters were tasty. Service: First off, the staff were polite and friendly. However, they seemed inexperienced, had a short memory, and was likely understaffed anyway. Value: I'm a RK member and had 50% off the bill, which is the only reason why two stars were given for "value" rather than just one. Firstly, let me say the food was lovely and the cocktails were great! That is about all I can say was good at The Rum Kitchen. We arrived 15 mins early and we asked to wait at the bar, yet three walk in parties were seated immediately. Then 10minutes past our booking, we were finally seated but only because I asked if our table was ready. When we thanked the lady for seating us, we received a curt "yep". Then when the waitress came to take our order, she didn't write it down and low and behold our order was wrong! We asked for water and never received any. When I asked for the bill, we waited 30 minutes before finally flagging someone down to get it for us (the lady I initially asked had gone on her break). When we recieved the bill, it had the items that we had ordered but never received on there and I had to ask for them to be removed. Overall, bad attitudes of 3 staff members (including the lady who appeared to be the manager in charge) and will not be returning, despite how good the food was.